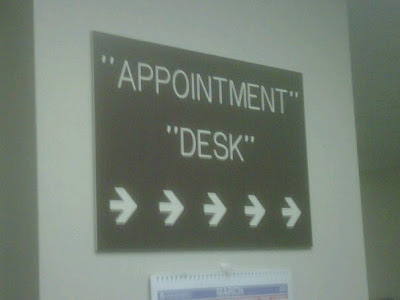 The “Blog” of “Unnecessary” Quotation Marks: "appointment" "desk"
I have no idea what this "desk" is really for. Something related to appointments perhaps? Or holding "appointments"? Thanks John. It's an examination table to which they strap unsuspecting victims! It's an agent of the Mafia, standing in the doorway to the godfather's house.